Anna Leese is a graduate of the University of Otago, the Royal College of Music and the Benjamin Britten International Opera School. Her awards include the 2004 Royal Over-Seas League Competition and the 2005 Richard Tauber Prize. Anna made her Royal Opera House debut in 2006 as Tamiri Il rè pastore, returning for Musetta La bohème, Micaela Carmen, First Lady Die Zauberflöte, Arminda La finta giardiniera and Echo Ariadne auf Naxos. For New Zealand Opera, she has sung Ilia Idomeneo, Cleopatra Giulio Cesare and Tatyana Eugene Onegin. She sang Antonia in Les contes d'Hoffmann for Cologne Opera, Tatyana for Flanders Opera and Musetta La bohème with the Canadian Opera Company. Anna is an Associate Artist of the Classical Opera Company. Concerts have included Mahler's Second Symphony with Bernard Haitink and Beethoven's Ninth Symphony with Carlo Rizzi. Her BBC Proms debut was with the Scottish Chamber Orchestra, conducted by Sir Roger Norrington. Anna has appeared in gala concerts with José Carreras. Recordings include a recital with Graham Johnson and a Haydn disc. She is a member of the Prince Consort. Future engagements include Suzel L'amico Fritz and Tatyana Eugene Onegin for Opera Holland Park, and Freia Das Rheingold in concert with the Auckland Philharmonic Orchestra. Anna enjoys running, netball, cooking and art. 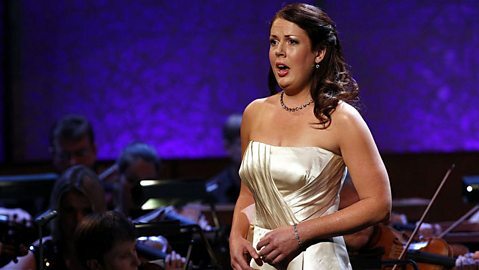 Anna Leese from New Zealand sings Song to the Moon from Dvorak's Rusalka.